WASHINGTON -- Pharmaceutical chief Martin Shkreli refused to testify Thursday in an appearance before U.S. lawmakers who excoriated him over severe hikes for a drug sold by a company that he acquired. Rep. Elijah Cummings, the top Democrat on the panel, berated Shkreli: "I call this money blood money ... coming out of the pockets of hardworking Americans," he said. The 32-year-old Shkreli faces separate criminal charges of securities fraud in connection with another drug company he owned. The lawmakers summoned him to answer for the decision that made him infamous: raising the price for Daraprim, the only approved drug for a rare and sometimes deadly parasitic infection. The brash entrepreneur and former hedge fund manager, who pleaded not guilty after his arrest in December in New York, has been out on $5 million bail. He walked into the packed hearing room well before the session began and met the crush of cameras. 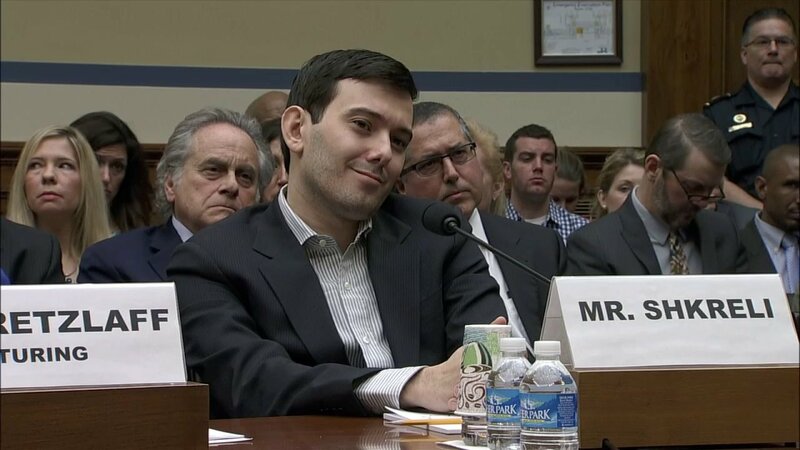 Even a few members of the House panel were swept up in the curiosity and snapped Shkreli's photo on their cellphones. He wore a sport jacket and button-down shirt, conservatively preppie attire. Also appearing before the lawmakers is Turing's chief commercial officer and the interim CEO of Canada's largest drugmaker, Valeant Pharmaceuticals. Documents from Valeant and Turing show they have made a practice of buying and then dramatically raising prices for, low-cost drugs given to patients with life-threatening conditions including heart disease, AIDS and cancer, according to excerpts released this week by the House panel. The two companies' executives argue that commitment is to ensuring that cost isn't a deterrent for patients who need the drugs. Presentations by Turing executives, part of the trove of documents, show that as early as last May, the company planned to turn Daraprim into a $200-million-a-year drug by dramatically increasing its price. Turing bought the 60-year-old drug from Impax Laboratories in August for $55 million and swiftly raised its price.